It&apos;s common knowledge that a small handful of artists remain at the top of the music sales charts in any given year, and unsurprisingly, 2015 isn&apos;t much different. But still, when you look at a breakdown of the Billboard Hot 100, a singles-focused record sales chart, over the last year, you might get an entirely new appreciation for just how dominant a few artists really are. The folks over at Rukkus dove into the data with a series of infographics, and the visualizations bear out the obvious: Drake, The Weeknd​, Taylor Swift, and Fetty Wap are pretty much in a league of their own this year. For reference, according to Rukkus, Drake has had 29 songs appear on the Billboard Hot 100 in 2015 alone while The Weeknd and Fetty Wap have had eight and six respectively, breaking sales records as new artists in the process. 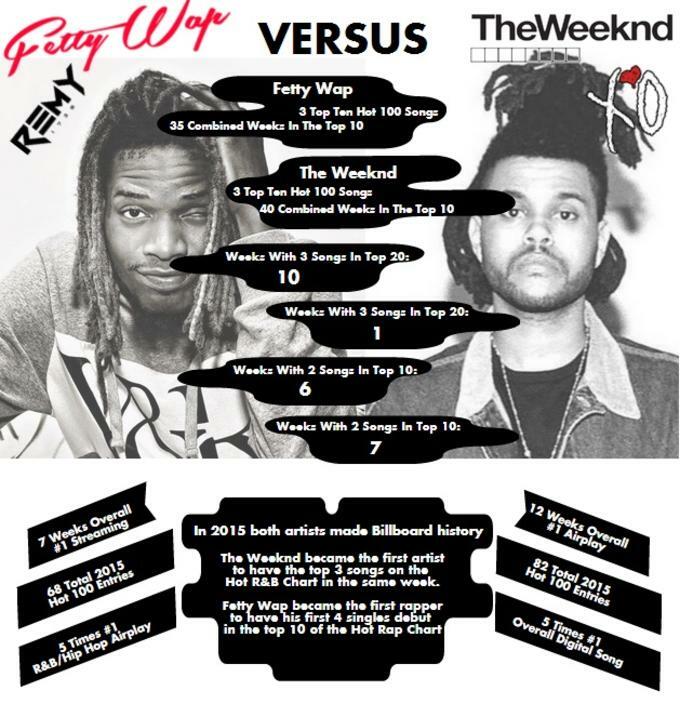 Check out a few infographics breaking down the info below: the first tracks Drake&apos;s Billboard Hot 100 performance over the year with dotted lines indicating songs on which he features, the second track&apos;s the path of charting singles over the year, and the third pits The Weeknd and Fetty Wap&apos;s performances against one another. Head over to Rukkus for even more. The Weeknd Scores His First Billboard Hot 100 No. 1 Song With "Can't Feel My Face"